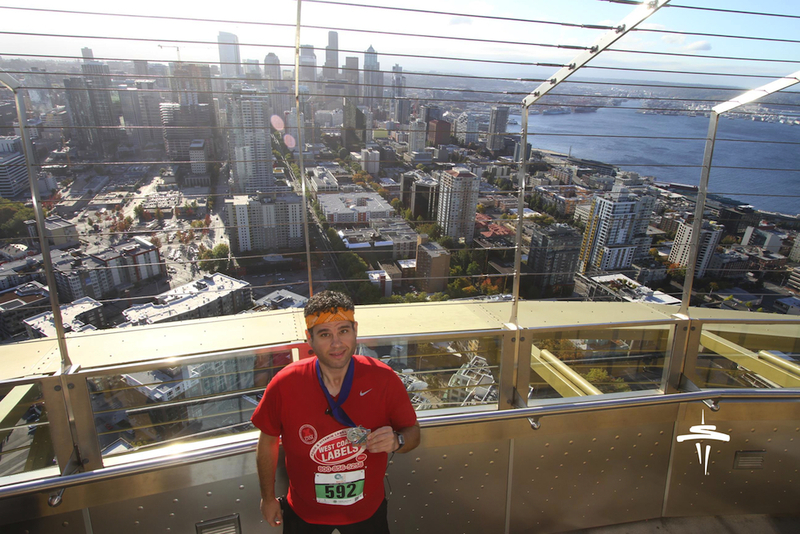 Race Recap: I Competed in the First-Ever Race up the Space Needle’s Stairs! | Keep It Up, David! It’s wasn’t exactly kismet or anything. 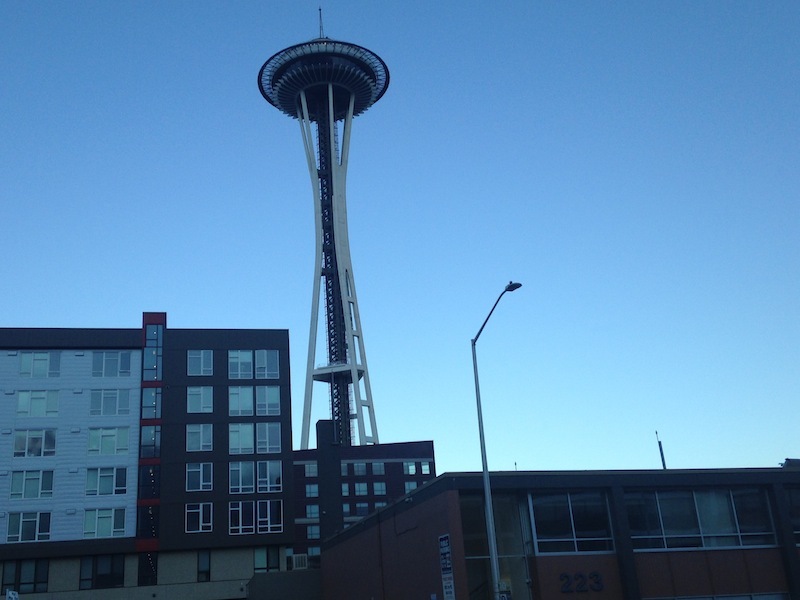 First of all, the Space Needle is hard to miss, and secondly, I chose this hotel partly because it was two blocks away. Even so, seeing it got my heart beating a little faster, and I smiled, because I knew that an hour later, I’d be in the stairwell, racing to the top. The Space Needle is set apart from the rest of the Seattle skyline, so there’s nothing nearby that you can compare it to, height-wise. As a result, it’s a looming presence in the neighborhood, but it still looks somewhat delicate, and lighter than it should be, thanks to all the perforations in the columns that hold it up. 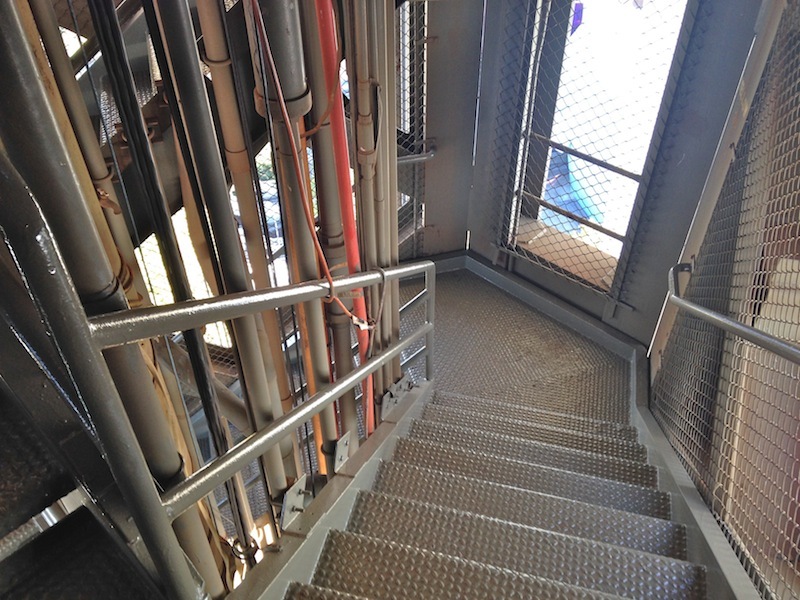 It was built for the 1962 World’s Fair, but never in the Needle’s 53-year history have they ever opened the stairwells to the public. Until Saturday. 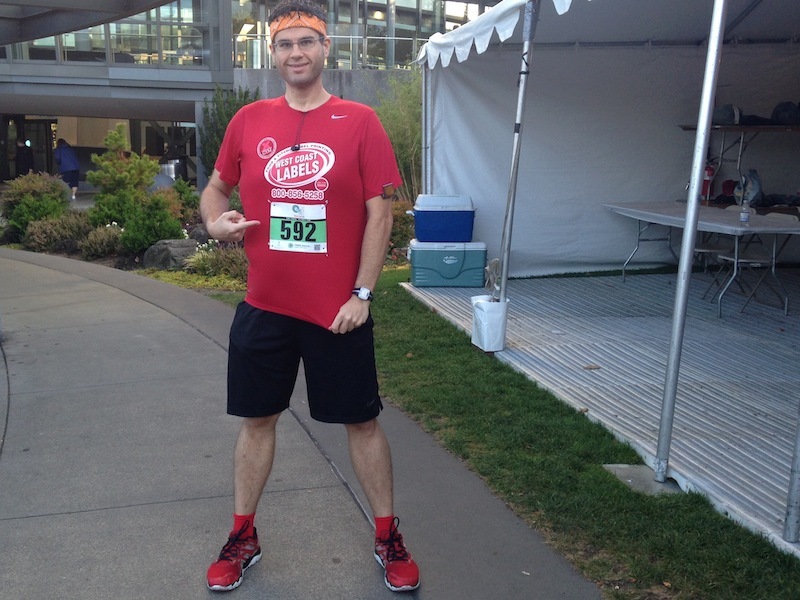 That’s when the inaugural Base 2 Space race happened, benefiting Fred Hutch Cancer Research Center. I couldn’t resist being one of the first people on the planet to go up those stairs, so off to Seattle I went! I picked up my bib before my 9am start time. Good ol’ lucky number 592! They had different waves that you could sign up for, and they based them on how fast you could run a mile. The fastest folks, including many of my friends, raced at 7am. I selected the 2nd-fastest wave, which they called the “Runner” wave. My wave was huge – probably over 100 people – so I made sure to get as close to the front of the line as possible. It was chilly that morning, and I wanted to get in and start racing, and not stand around in the cold. I had heard that there was the potential to pinch your fingers at some places, where the handrail comes awfully close to pipes, so I wore my full-fingered grip gloves. They’re actually designed for car mechanics, with the entire underside of the glove made of grippy material, but they work great for stair racing, so I can still grip the rails after my hands start sweating. 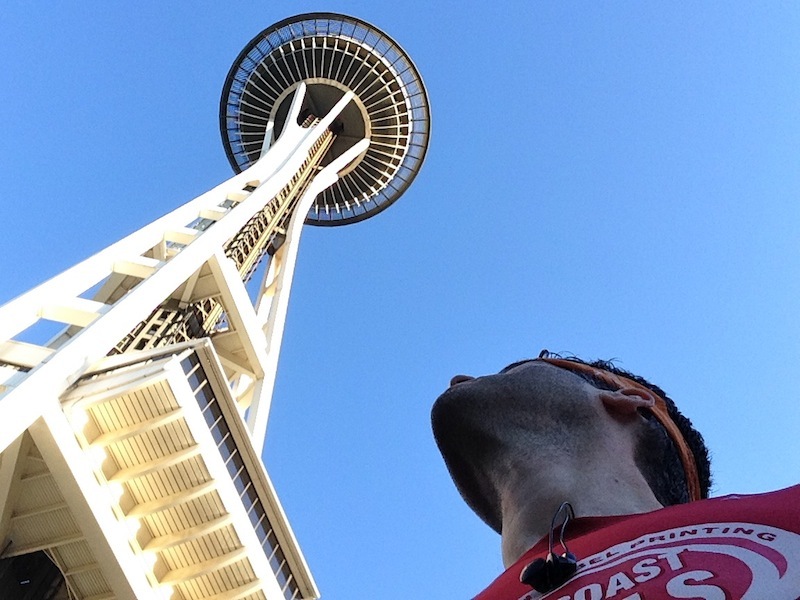 The race started outside, at the back of the needle, and while I waited to start, I couldn’t help but look up. It’s a tall tower! 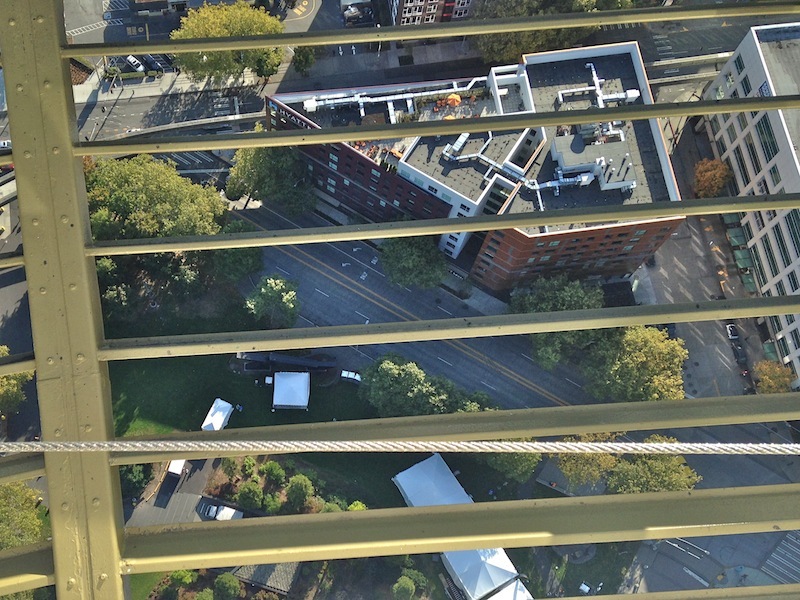 The tippy-top reaches 605 feet into the air, and the top floor (where the race ended) is about 518 feet up. Race organizers promoted the event by saying it’s 832 steps and 52 stories tall (although those would pretty short stories, compared to the office buildings that these sorts of races are often held in). The stairwell itself is unlike any other I’ve raced in. There are actually two stairwells that wrap around each other but never intersect, like the double helix you see in drawings of a DNA strand. The stairwell is also triangle-shaped, with the center being the vertical core containing all the plumbing and pipes and such. This photo shows both sets of stairs. They never intersect. The stairs you see in the upper-left corner are a completely different set than the stairs at the bottom. Plus, the stairwell is open-air! There’s just some simple fencing separating the stairs from the rest of the sky, and that’s completely awesome. The race utilized both stairways, and during my wave, two racers started every 30 seconds. We entered through the same doors, and then split off, with each of us going to a different stairway. I entered at 9:04am, and dealt with my first hiccup seconds later, when my cord for my earbuds snagged on something as I turned the corner into the stairwell, ripping my earbuds out of my ears and sending my iPod flying off my shirtsleeve. Thankfully, a volunteer saw it happen, and pointed to my iPod lying on the ground. I turned around, snatched it up, and bolted for the stairs. I lost a few seconds there. I didn’t want to take the time to rewire myself, so I shoved the iPod in my pocket and started up the stairs, with the cord dangling from my shoulder, swinging this way and that. 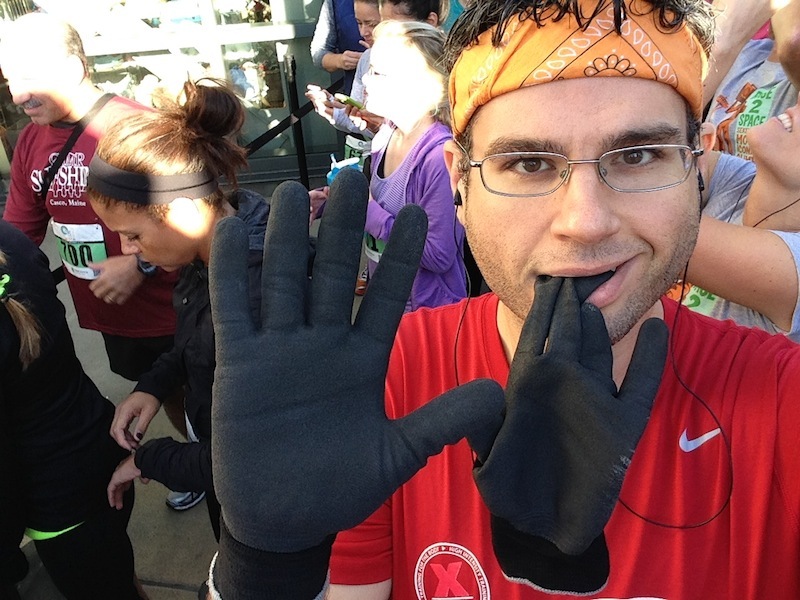 RELATED CONTENT: Click Here For Many More Stair Race Recaps! I found my rhythm early on, and set an aggressive pace. The flights were shorter than in office buildings, and turning was easier – there were only 120-degree turns instead of 180. Plus, there was a view! I could watch myself get higher and higher, and a couple times, a huge shadow fell across me – an elevator was passing by, on the outside of the stairwell, gliding quickly and silently. 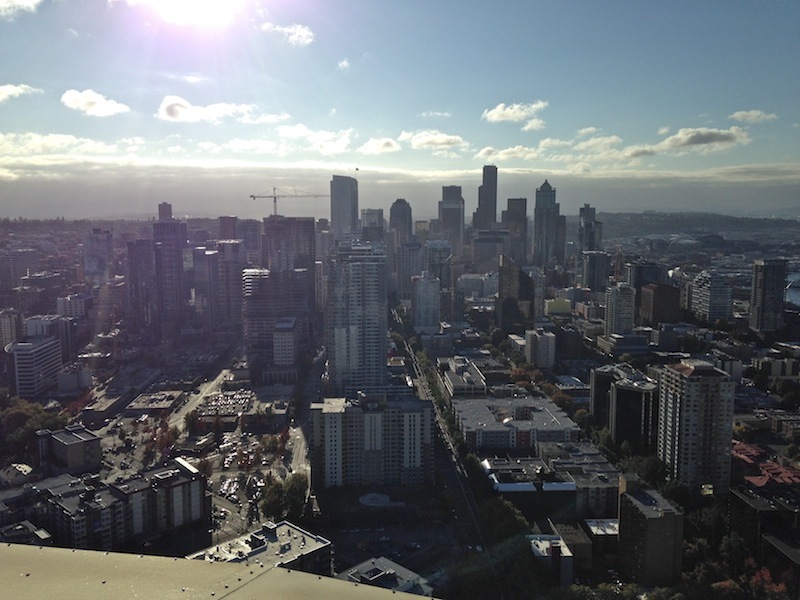 I never stopped, but I glanced as often as I could, seeing the Seattle skyline getting farther and farther away. 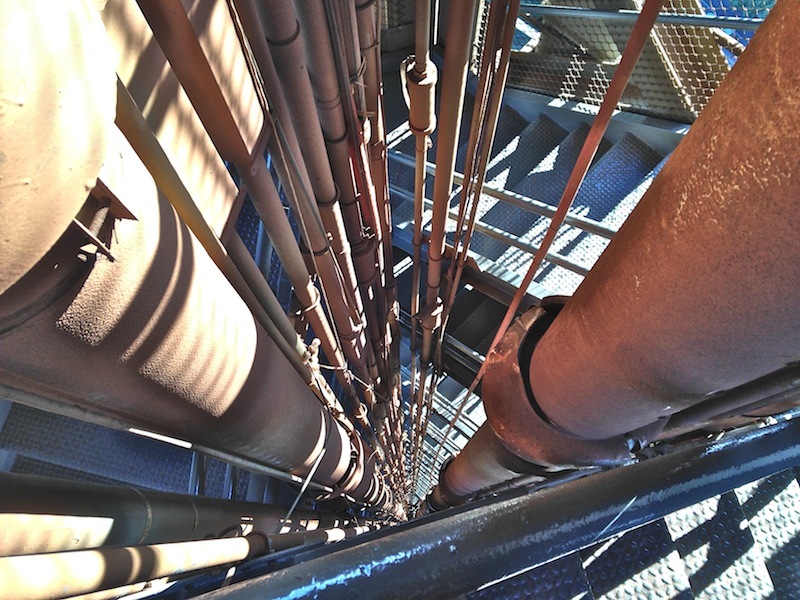 I also peeked once down the center of the stairwell, a void that went all the way to the bottom, lined with pipes. Around the halfway point, I felt myself slowing down, so I took my hands off the rails for a couple flights, and, as I climbed, hooked up my iPod again. Having my music helped me keep charging ahead. 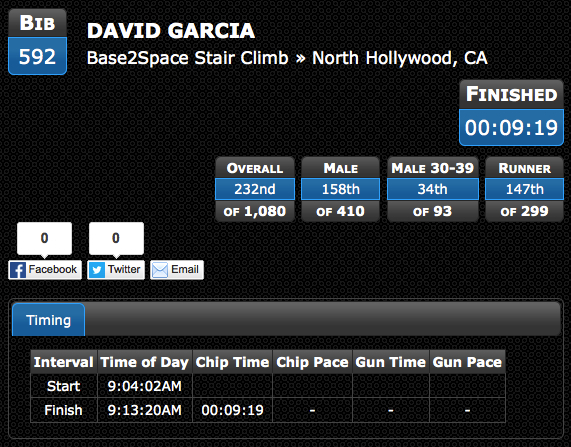 This race was my 24th stair race, but I’ve never had to contend with wind before. That was a fun little bonus, courtesy of the open nature of the stairwell. The wind was cold, but that didn’t bother me – it felt nice. But it was strong. Stair climbing is tough enough as it is, but no matter which side of the triangle I was on, it always felt like I was climbing into the wind! Ultimately, though, between the views, the unique design of the stairwell, and the intermittent blasts of sunlight and wind, there were a lot of things that took my focus off the burn in my legs, my pounding heart, and my aching lungs, and I liked that. A lot. The climb seemed to fly by, and soon, I had reached the 5-story pod at the top – time to turn it up and sprint to the finish line! 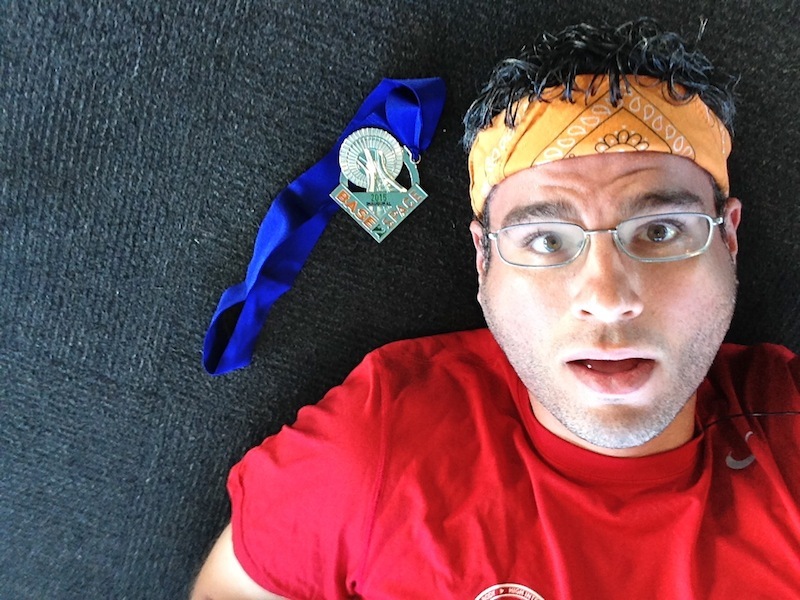 There were volunteers at the finish line, passing out medals and water, and I took them both, stumbled to the windows, and collapsed. ..and the street way way way down below. There’s a camera mounted on the exterior of the observation deck, and a volunteer was passing out coupons for a free photo, and I couldn’t pass that up! Basically, I finished in the top quarter of all participants, and roughly the top third of all men. I’ll take it! I came down the elevator, and the exit route passed right by the starting line. 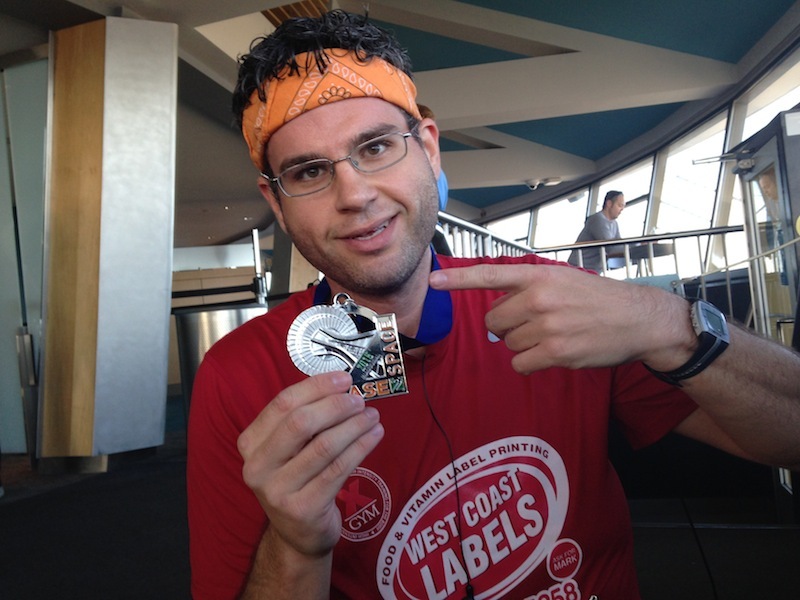 The next wave was wrapping up, so I sneakily peeled the timing chip off my bib and slipped back into line. A few minutes later I was back in the stairwell (the other stairwell, actually), climbing again, just for fun. (That’s when I took the pictures of the stairwell and core.) 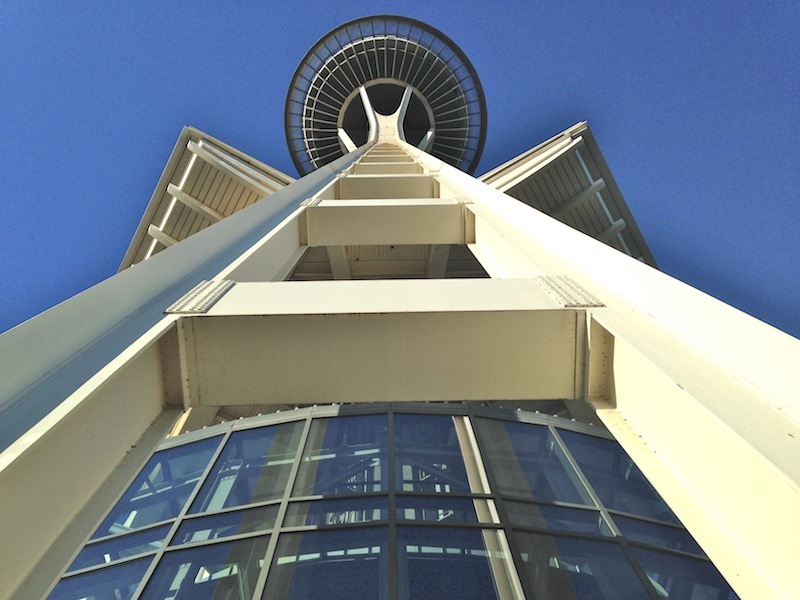 This was the first day anyone has been allowed in the Space Needle’s stairwell, and, damnit, one climb wasn’t enough! PS: A hearty thank you to my amazing donors: Collin, Suzanne, Amy, Joanne & Joe, Dana, Michelle, and Mary. Collectively, these folks gave Fred Hutch nearly $300 dollars, allowing me to chance to climb, and I’m incredibly grateful. This entry was posted on Wednesday, October 7th, 2015 at 1:46 am and is filed under Uncategorized. You can follow any responses to this entry through the RSS 2.0 feed. You can leave a response, or trackback from your own site. 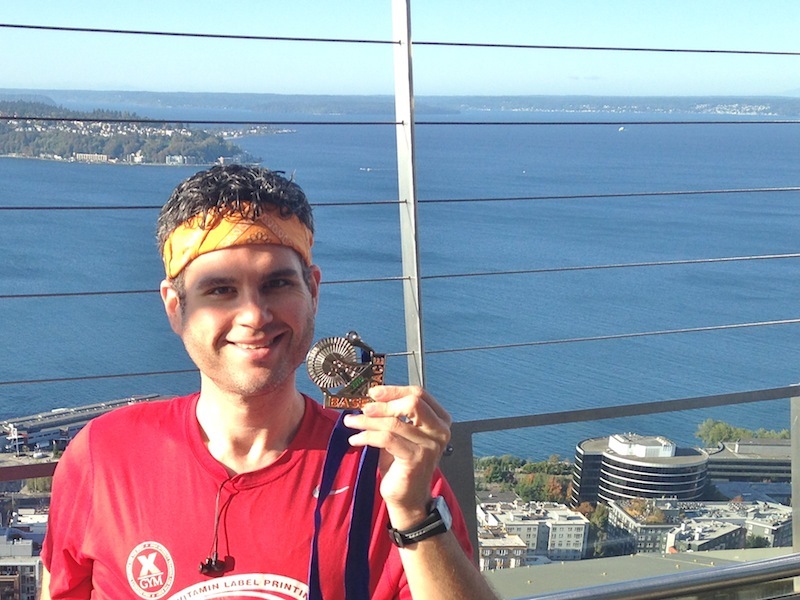 5 Responses to Race Recap: I Competed in the First-Ever Race up the Space Needle’s Stairs! Congrats…you even managed to get a (mostly) clear day! Did you run up the second time too?? Some of it, Rob. I also stopped for generous photo ops, and to let people racing have ample room. It was much more leisurely. But I still finished in around 11 1/2 minutes. It was an incredibly beautiful day for the race. Caught the race on the local news, fun to watch. Congrats on such a terrific race! Thanks for the interesting report! Very cool that you were able to climb BOTH stairwells! You’re welcome, George – good to see you last night!